Peter Jackson’s “The Hobbit” is like cram, the bread the dwarves eat for weeks as they explore The Lonely Mountain — and for much longer as men and elves lay them siege. It sustains but does not nourish, providing energy but no taste. It has some value, to be sure. It’s not great, but it’s all we have, perhaps for a long while. It is loud, brash, exciting for a time, occasionally vulgar, rarely soaring, already being forgotten by many, and part one of three. It is an epic for our time. In fact, one reason it came out as it did — part video game, part unfunny, part honest, part book-true, part intro to the LOTR movie trilogy — is that sustainability — the idea that it “keeps good indefinitely” and is made “for long journeys.” Jackson says he decided to make a trilogy out of the small and simple book, because he believes a movie of it will never be done again. I don’t agree. 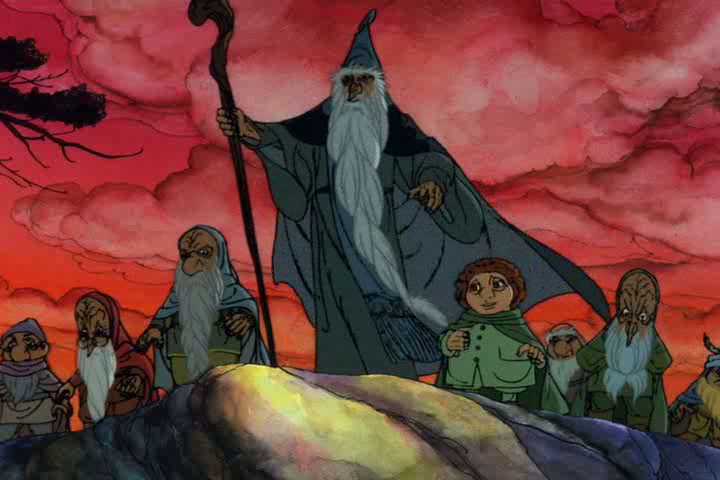 After all, a movie of “The Hobbit” was made just more than a generation ago, in the late 1970s, and things move a lot faster these days, as we’re constantly reminded. We may say the cartoon version is flawed, and we employ cliché to do so. But it was big stuff at the time, it has one or two moments of its own, and it was roughly only a generation ago. Who is to say that in 35 more years there won’t be another? After all, it is just half of the Bible’s or Dante’s three score and 10 — and either of those have greater authority than this movie or us, as they are epics for all time. Who among us can say the technology available three and a half decades hence will not call to another maker of movies (or whatever our children’s children will call such things) for a (nother) new version? For that matter, many of us won’t even be here to say it, period. Peter Jackson, breathes he still 35 years hence, will be in his 80s — as Tolkien’s son Christopher is today. Someone will own the “rights” to do it and, given that the books will endure (and they will) there will no doubt be loadsa dosh, money, to be made in running over them all over again. Jackson says his work was guided by this “last chance” to last forever … which isn’t as long as it used to be. Yet as a creative vision, I give this view its props — and the same to Peter Jackson himself, for that matter. He made “The Lord of the Rings” and he made it big and flowing. It was more proper to do so, since the books trilogy The Lord of the Rings already is. And like Tolkien, Jackson surely thought even that was too short — Tom Bombadil being the best-known part cut entirely; for, maybe none of us would know what to do with four movies! And unlike Tolkien, who as he wrote The Hobbit clearly didn’t know what he had sub-wrought, Jackson knew he had the existing trilogy to work for, toward, at, in, with and under. To make three movies that leads us into the next (already made) three movies — and who knows, but perhaps we will see three others to conclude the Middle Earth ennead. Maybe that’s coming. It’s working for “Star Wars” … so far. Nine rings anyone? Thus on “The Hobbit” did Peter Jackson proceed to make 1) what he thinks will be the last chance, and 2) what must be an intro to his LOTR movies. With those assumptions, and life as we live it, “The Hobbit” came out more or less exactly as it has to. Our system was perfectly designed to produce the movie we received. This means instead of the wizard — a wizard, mark you — of John Ronald Rueul Tolkien’s beloved forest, we get some whacked out, ‘shroom eating, ditzoid, as crazy as the batshit in his hair. Instead of a goblin king terrifying to his last breath, we get a doofus deadpanning the camera as he dies. If we expected actual dwarves — hardy and fell and grim, JRR T would say — we get a troop of swashbuckling midgets in one CGI choreography battle scene after another. We get an epic for our time. It rends but does not render, pulling out the heart and mind, leaving some of the guts, putting the parts in a too-large body, like Dr. Frankenstein’s hideous vision made most flesh, the monster which does not improve on the human, but makes it outlandish, a grotesque. Tolkien’s story was small and its smallness its greatness, as Gandalf says often about the hobbits themselves. Peter Jackson took a page from Tolkien — a few here, a few there — and pastiched them into his plan. Like “The Words,” Jackson took what Tolkien had written and used it for his purposes, rending heart for a garment of dubious, and temporary, value. The movie is not without some value. But then, neither is cram. It was fun — that catch-all word. It was “a good use of my time” the Netflix reviews will one day say. More deeply, there is heroism and camaraderie, some real humor and more than a little courage. Given the material — The Hobbit is really quite the simple tale, shortly told, with “rescue” chapter following “danger” chapter alternating, again and again, until the end — it comes to the screen grand. But it tastes like cram. And cram is what the dwarves, nearing the end of the book and the end of their adventures, must eat. They have nothing else — even when some of them are sent to find the ponies Smaug didn’t devour, and the stores they carried, we hear only of cram. Only they don’t have to eat it. When I re-read the book before seeing the film, I wondered why Thorin didn’t send a hunting party out every day, to lay in food for the siege he most certainly knew was coming. Tolkien could have said that Smaug had decimated the surrounding area over the years and no animals remained, but he didn’t. They could have fished as well. Heck they could have killed and eaten the ponies, which were no longer needed, now that they were home. If they ate cram because they had to, they only had to because they did not work for something better. If there was no venison to place between two slices of cram, no wine to go with the bread, it was the dwarves’ own doing. The dragon is dead, the fortress retaken. The dwarves, like Jackson, believe their story ends with no more tales to tell. But it is not so. The road, as was once said, goes ever onward.